admiral, Xracer, Dryden-Tdub and 3 others like this. Flathats and Darth like this. Jump school is probably much better in Georgia. Jumping over Yuma with new USMC chutes,(old Army hand-me-down parachutes), was a bit iffy. One bad thermal and we're landing in Mexico. Best/Worst thermal I ever caught in a T-10 was over Ft. Polk Louisiana. Day time "fun jump" following a few day's of training exercises. A cold front was approaching while we were loading the aircraft but it was a warm sunny day otherwise. We were exiting the plane at roughly 1400 ft and I remember when I left the door a rush of VERY cold air. I didn't think much of it because we were all rather warm and sweaty on the plane. Anyway the chute opened quickly and as I was checking my descent relative to the other jumpers I was again warm and toasty. Cool! I was the first man out of the right side door so I should have been one of the lowest jumpers in the air. I was not! It took me a minute to realize I was climbing altitude but when I finally realized I was trapped in a thermal I began my slip out. It took probably a full minute of slipping right until I reached the edge of the thermal and as my parachute exited my canopy began to collapse. Cold air was now pushing down toward the ground rapidly. I was aware that this was possible but it still startled me. After a brief free fall the canopy filled again and I was on the ground in a few minutes. 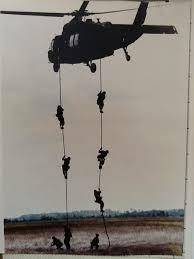 Later that evening I was speaking with the jumpmaster from my plane and he told me I was estimated at 2200 feet at my apex! In my 6 year career this was easily my longest time under a canopy while in uniform. Fred, Flathats, admiral and 1 others like this. Awesome well told story Tom! MUCH happier ending than the cold night jump that I experienced way too many broken suspension lines. All of them from the right side of my chute! That one hurt! Why you folks jump out of perfectly good airplanes is beyond me. Isn't that what helicopters are for?